"Stop chasing viral, and start looking closely at online video that delivers repeatable, measurable and sustainable views. When putting dollars behind video projects, make sure you understand exactly how the audience-development component works. You don't want to pay for views that never actually get watched. And remember, just like with the Tortoise and the Hare, steady and consistent wins out over jackrabbit view spikes every time." Whole article here: Ad Age Article: Screw Viral Videos. "Great content, well planned and well executed will trump the chasing of viral propagation." Product marketing, customer engagement, internal communication ... all can be improved with quality video online. Why are you not taking advantage? At iFilm we find more and more of our projects are being created only for online applications. Our clients want videos that look crisp online. And we think production values are more important than ever before when the customer attention span means you are one mouse click away from being turned off. 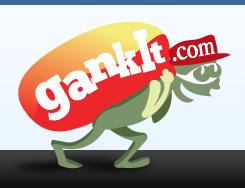 iFilm Productions' newest client, GankIt, took their 2.0 version of their website live overnight. We produced their home page web movie that explains their service - a hybrid penny auction. Many thanks to Dan Pratt of RiotMotion and Bob Vance of Audio Bob for their work on this project. If you haven't Ganked yet, the time is now. 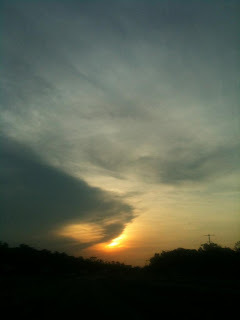 I will post a link to the video on my blog and site later today but for now, I want everyone to head on over to GankIt. Just because you add video to your site, it doesn’t mean that viewers will watch it. 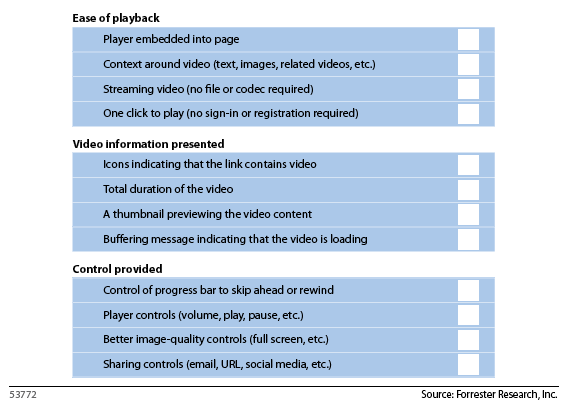 Use the chart below(also from Forrester) to checklist your online video. These are great. 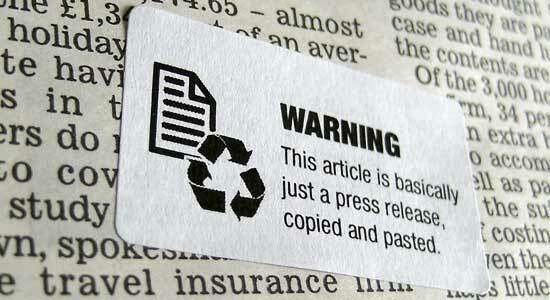 Think of all the news stories that you read or hear about that sound completely fabricated, isn't it a great idea to be able to slap a label on those things. Scott needs to create them in digital format for people to append to blogs or other posts where there is complete nonsense in play. Love seeing how powerful video can be as an online tool. As a long-term video producer and director, the explosion of video merged with quality motion graphics allows me to do great work for client getting away from the traditional formats required for TV commercials and allowing constant ongoing updates to encourage consumer engagement. Why does Apple make it difficult to advertise? Why force themselves into the creative process? Why not a standard format and template and let the winners develop in the open marketplace? Good creative that connects with consumers will deliver positive results for advertisers. Good content will prevail in the end, Apple needs to let it happen. Random aside: Oddly enough, Apple does the best job of making all their technology work together based on standards across platforms. Their hardware division seems to embrace standard connectors and power chargers, should hardware help the software side of the house get its priorities straightened out? If You Build a Web Series Around It, Will They Come? "In the past three years, it seems "Make me a branded web series" has become the new "Make me a viral video" for marketers, with brands as varied as Ikea, Procter & Gamble, Toyota, Kraft Philadelphia Cream Cheese and even Poise incontinence pads all trying their hands at branded storytelling online. But as these webisodes clamor to find audiences in increasingly fragmented numbers, a larger metric for success pervades: Did they actually deliver on the hoped-for ROI for the brand? For marketers, the typical web series consists of a half-dozen five-minute episodes costing an average of $100,000 to $1 million to create -- a paltry sum considering a typical 30-second spot can cost more than three times the price the most expensive web show. Yet the bar has been high ever since "In the Motherhood," an online sitcom co-created by Mindshare Entertainment on behalf of clients Sprint and Unilever, became a massive hit on MSN, accumulating more than 16 million views by its second season and eventually becoming a sitcom for ABC. But its swift broadcast cancellation forced advertisers and producers alike to re-evaluate the ultimate metric for determining a web series' long-term success: Instead of being picked up by a TV network, why isn't re-investment by the brand the new barometer for success?" Dave here: Web Series are enticing, it seems you can create a personality, create a buzz and see long-term success. Good production values remain key in winning at this game. Wil this trend continue? Soap operas were called such because P&G was selling dish soap so yet again they are leading the way and they have a long history of success. Web series are here to stay. If you want to start your own web series, contact iFilm Productions so we can be your production guide. Many thanks to David Kaiser for this thought. "While interactive or "hypervideo" is still the exception versus the rule, major strides are being made to create more immersive online experiences. To help the process and create more dynamic video experiences, here are some ways content creators can bring more interactivity to their online content. One of the biggest leaps into interactive content is the ability to present information in context. Publishers and brands can now enable viewers to enjoy truly immersive experiences with content, fostering longer viewing times and more focused advertisements that speak to consumer interests. Here, online video can include points of interest, such as the ability to click on a product and purchase it. This not only extends a brand by creating interactivity on a commerce level, but also creates new engagement avenues for brand loyalists. In the realm of linear content, imagine how product placement can reach new consumers in the form of fans of a program, as well as new environments for a brand to live in the digital world. Interaction does not only need to be about using a mouse. Social media makes it easier than ever to get the word out about online contests and participatory ad campaigns, and of course to directly engage with consumers. By allowing consumers to "take over" your brand and make their own statement, you might be surprised what creative life a Flip cam, some ingenuity, and brand loyalists can bring to your product. Brands are also discovering that loyal fans can breathe new life into products and make memorable ad campaigns from the ground up. Participation can also come from the business side. Want to share some tips or talk about your latest product innovation? Get personal with a simple webcast to provide an authentic, first-person account about your brand. With the launch of the iPad and other devices that use physical touch as the primary way to use these technology products, true "hypervideo" experiences are a natural complement to this increasingly popular way to interact with our computers. I define hypervideo as the convergence of online video, social media, weblinks, and commerce into one immersive experience. For both traditional PCs and touch-based devices, software solutions with cross-platform creation and playback tools bring interactivity to new heights. Beyond two-dimensional clicks, hypervideo at its best combines one part web with one part video to form a singular experience. With an enhanced online ecosystem, content creators can make one-of-a-kind video experiences for audiences and further customize them with demographic data such as gender, age, and personal preferences. Hypervideo represents the best of what's to come in creating immersive, online experiences. It's the most dynamic platform to engage so-called "superfans" and to seamlessly integrate logical brand representation into both linear and viral online programming. This can include anything from delivering Facebook profiles straight into the video viewer to presenting related content, such as a profile of the director, actor, or lead costume designer of a show. 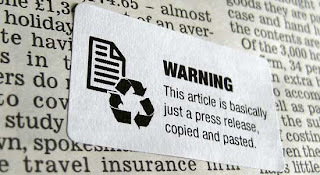 These additional features also provide ways for programmers to create "sticky" content and prolong audience engagement. Online video presents exciting new ways for audiences to interact with programs, brands, and businesses. With new interactive software and other engagement tactics available, the sky is the only limit to how rich we can develop online content." Great starter introduction from Google on Making Your Videos Searchable. Don't want to learn all this yourself? Contact a video production firm who can assist you in completing, like me ... at iFilm Productions. My most recent projects are all for online applications, shooting and creating for the small screen is a different sort of challenge than shooting for a 50" TV screen - in a good way. A new video project asks small-business owners to share their survival stories. Almost every successful small-business owner has survived a near-death business crisis. Today, the NY Times is beginning to collect these personal stories in a series of video contributions called How I Saved My Company. Have a story you want to share with them? Let me know and maybe we can work on it together. I have been working on a video project for a company called GankIt which has me thinking a lot about crowdsourcing. Have you used a crowdsourcing solution? Does crowdsourcing improve your results or randomize them? I am headed to Broussard, Louisiana for a video shoot today and the sunrise was spectacular. The population of mobile video viewers in the US will grow nearly 30% in 2010 to reach 23.9 million, according to eMarketer’s forecasts. The still represents a reach of only 7.7% of the total population and less than 10% of mobile phone users, but those numbers are set to double by 2013 and increase still further in 2014. The number of mobile video viewers, which includes people of any age who watch video content on mobile phones through mobile browser, subscriptions, downloads or applications at least once per month, will continue growing in the double digits for a compound annual growth rate (CAGR) of 22.8% from 2009 through 2014. Start planning your videos now! Haiti is a distant memory in the sense of media coverage. Yet people there are still struggling to get by and need the most basic item -- clean water. Publishers with a Purpose is out to prove that the media can do more than just highlight disaster -- it can help rebuild. We are mobilizing our network to donate a collective 40,000,000+ ad impressions for the Unshaken campaign and are committed to raise $95,738 for the community of Nan Simon in Central Haiti. This project will serve almost 2,500 people. I produced a video in Haiti for the US Agency for International Development (US AID) years ago and was moved then by the people in that country and if this post can help, then I am happy to do it. Ford broke new ground yesterday by revealing a new vehicle, the 2011 Ford Explorer, on Facebook. Throughout the day, the company hosted live chats and rolled out exclusive photos and videos -- including Ford executive conversations with Dirty Jobs' Mike Rowe, a proud Ford spokesperson. Lori at iMedia posted this thought and wondered what else will happen with the launch. Brand can not live by Facebook alone ... but what happens when you can't rely on :30 and :60 television commercials to reach audiences that are less and less frequently watching traditional television? Web video, Facebook, social media, experiential tours all seem part of the answer to that. What do you think? Why testimonial videos in healthcare? The educational and emotive power of video combined with the reach of YouTube is a tool health communicators can’t ignore. My thanks to Kevin Kru at Kru Research for the statistics.